I used to be a tried-and-true Splenda consumer—using it in everything from plain yogurt to coffee to iced tea. After learning about the dangers of refined sugar, it seemed convenient, like the next best option. However, nutritionist after nutritionist begged to differ. "They're really the one thing you should completely cut out. Your health starts in the gut, and research shows the negative impact of artificial sweetener on gut health and metabolism," says Farah Fahad MS, RD, dietitian. "The Center for Science in the Public Interest has changed the safety rating of sucralose from 'caution' to 'avoid,'" says Brooke Alpert, MS, RD, CDN, a nutrition expert and author. 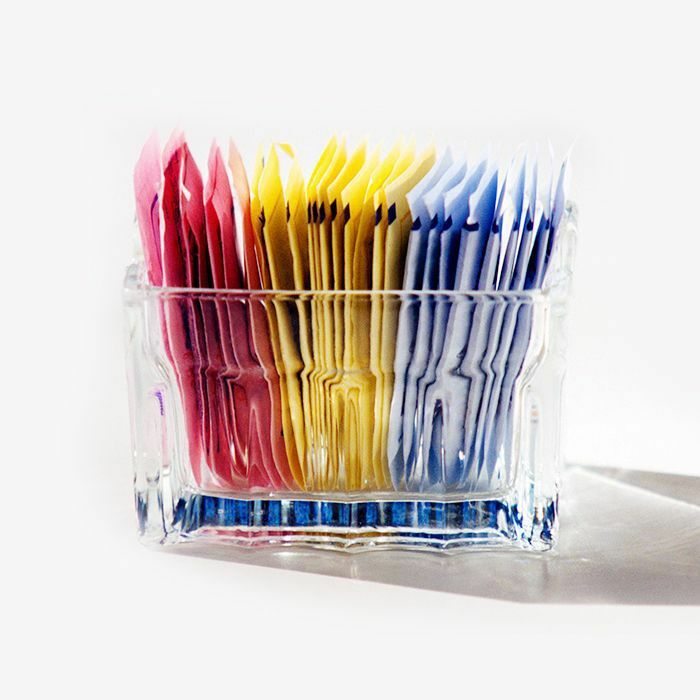 Splenda is now among saccharin, aspartame, and acesulfame as chemicals that should be avoided. Alpert adds, "Artificial sweeteners are so much sweeter than natural sugar that we've lost the ability to decipher what real sweetness actually tastes like. Ideally, you won't add sugar to your foods or beverages. However, if you must, try small amount of real sugar, Y.S. Eco Bee Farms Raw Manuka Honey ($29), maple syrup, or molasses." But still, even if artificial sweeteners aren't exactly the most healthy, I was still under the impression they were a helpful diet food. Wrong again. A recent study published in the Canadian Medical Association Journal followed more than 400,000 people for 10 years to disprove that notion. In fact, results suggested, over time, those who regularly drank one or more artificially sweetened beverages a day had a higher risk for weight gain. "I think there's an assumption that when there are zero calories, there is zero harm,” the study author Meghan Azad, an assistant professor in the department of pediatrics and child health at the University of Manitoba in Canada, told Time. "This research has made me appreciate that there’s more to it than calories alone." Diane Sanfilippo, a certified nutrition consultant and bestselling author of Practical Paleo, agrees: "Using synthetic, lab-made chemicals to add sweetness to your food should be avoided, especially if you're trying to lose fat." So there you have it from both a weight-loss and overall health perspective. From here on out, we suggest you skip artificial sweeteners altogether and opt for natural sugars like agave, maple syrup, or honey. FYI: This is what you need to do to actually have a "high metabolism."